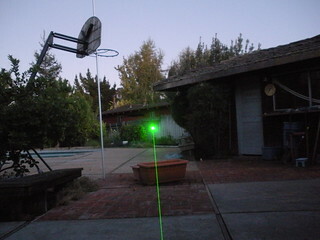 This is an outdoor shot of the beam of my Wicked Lasers "Spyder I Pro" laser. This photo was taken during early dusk. Update: I have replaced the original photo, which was slightly blurred and did not capture the contrast very well. This new version also corrects some minor distortion problems.